New Delhi [India], Dec 17 (ANI): India on Monday welcomed the release of Indian national Hamid Nehal Ansari, who was incarcerated in a Pakistan jail. New Delhi [India], Dec 14 (ANI): French Minister for Europe and Foreign Affairs Jean-Yves Le Drian arrived in India on Friday for a two-day visit. New Delhi [India], Dec 9 (ANI): External Affairs Minister Sushma Swaraj on Saturday met her Icelandic counterpart Gudlaugur Thor Thordarson and held talks over a wide variety of issues in an aim to strengthen bilateral relations. Abu Dhabi [UAE], Dec 4 (ANI): External Affairs Minister Sushma Swaraj called on Crown Prince of Abu Dhabi Sheikh Mohammed bin Zayed Al Nahyan on Tuesday during her ongoing two-day visit to the country from December 3 to December 4. 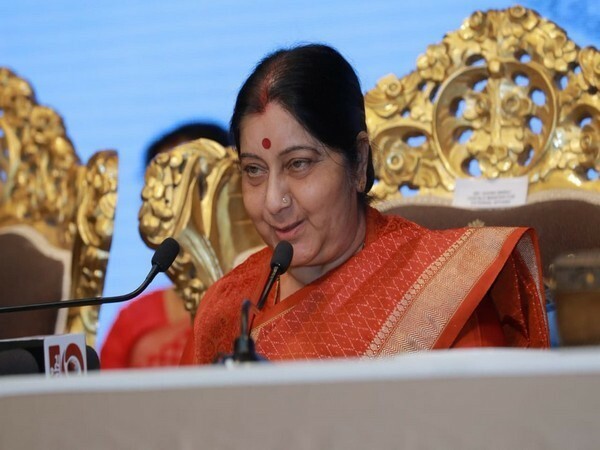 Abu Dhabi [UAE], Dec 4 (ANI): External Affairs Minister (EAM) Sushma Swaraj inaugurated the Gandhi-Zayed Digital Museum here on Tuesday along with Foreign Minister of UAE Sheikh Abdullah bin Zayed Al Nahyan. Buenos Aires [Argentina], Nov 02 (ANI): Prime Minister Narendra Modi on Saturday emplaned for New Delhi after a hectic three-days in Argentina where he attended the 13th G20 Summit for state leaders, apart from hosting a number of high-profile and historic meetings. Buenos Aires [Argentina], Dec 01 (ANI): President of Argentina Mauricio Macri hosted Prime Minister Narendra Modi over breakfast at his official residence here on Saturday.